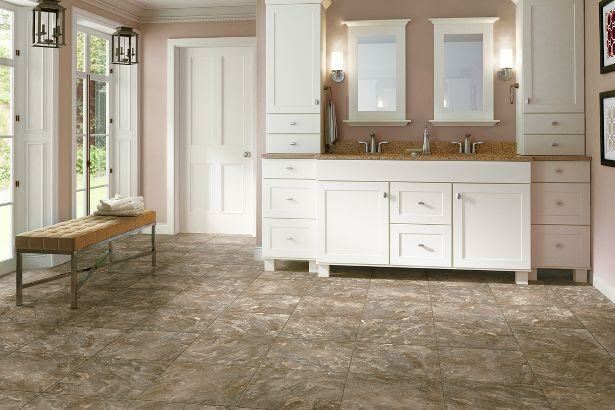 Luxury Vinyl Plank and Tile - F&F Floor Covering, Inc. When it comes to luxury vinyl, F&F has you covered. From installation, luxury vinyl planks, luxury vinyl tile, etc. you name it, we can do it! Luxury vinyl plank flooring is considered by many to be the perfect blend of style and functionality. Current styles by major manufacturers have never look better and more realistic. Luxury vinyl planks also offer in many cases a more durable and tougher floor than other options such as hardwood and laminate, especially when it comes to handling scratches and water issues. If you are one of the many consumers considering luxury vinyl wood looking planks, there are several things you will need to know when choosing your floor. Not all luxury vinyl flooring planks are created equal. There are quite a few differences between construction styles among the major manufacturers. Backing systems can vary between brands. Some luxury wood vinyl plank floors have residential warranties and others have a commercial warranty as well. Other differences include is the vinyl plank water proof or water resistant? Is the plank UV stabilized to prevent fading? Does the luxury wood vinyl plank you are looking at have a built in mold and mildew inhibitor? Also, some major manufacturers even certify their luxury vinyl to be hypo-allergenic. You can also compare thickness as a relative concept for durability. The basic, entry level products start at around 2 mil thickness progressing up to 6 mils. The key thing here is that not all luxury vinyl planks are built the same. Price can vary extremely among styles and brands. Prices can range from $.99 per square foot to $5.00 a square foot. If your budget is limited and you need to go with a cheaper, entry level luxury vinyl that’s fine. Just make sure that the price point you are paying matches the thickness and wear layer of the product you are looking at. You will see 2 mil products discounted in the lower range and work up from there. The important note to remember here is to make sure that you are comparing apples to apples while shopping a specific price range. Luxury vinyl planks have two basic installation methods. The predominate method is using a full spread adhesive. This is the most common type of application and is not recommended as a do it yourself project. The other installation type is a self adhering type. Do not confuse this with peel and stick. Peel and stick are a lower grade of vinyl and will almost always come up and usually have to be replaced within 3 years. The peel and stick types stick directly to the floor. The true luxury vinyl planks that are self adhering, stick to each other, not the floor. These luxury vinyl planks usually have a lip on two edges and a recessed lip on the other two edges that have a factory applied glue. You use the lips to glue the tiles together and not the floor. Currently Konnecto, Armstrong Luxe, and some styles by Amtico are the only valid offerings with this type of self adhering, do it yourself installation system. There are several finishes available in luxury wood looking vinyl planks. A smooth finish is what most consumers are familiar with. However, you can get a more realistic floor by using a plank that has a ribbed, hand scraped (simulated) or finish with registered embossing. These finishes give the plank a more wood look and style by adding texture to go along with the color and wood species. If you haven’t seen a sample of a luxury flooring vinyl plank with registered embossing, make sure you check one out before you make a final purchase, it’s pretty impressive.